Cut tape to 1.5” and wrap around the net to make the stem. (Use the side with the “hard” end). Press firmly to fix the tape to the stem and set aside. Cut the “hard” end of 2nd net and insert into hand. Remove net and insert 1st net through it. Straighten them with the stem sticking out. You should have 2 nets together now; 1 inside and 1 outside. Unfold the ends (the side without the stem), about 1”. Keep turning the net out, layer by layer and tightening it by pulling the other end until you get the desired shape. Continue until you reach the stem and you’re done. 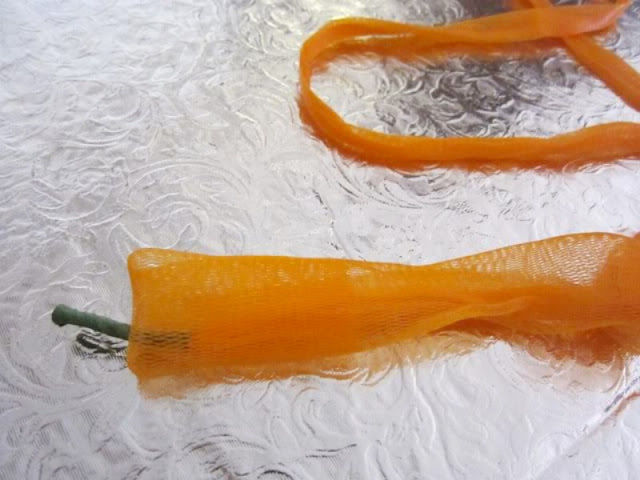 Next, insert leaves by piercing them through the net and you’ll get your striking fortune Tangerines. Impressed with my mom’s work? 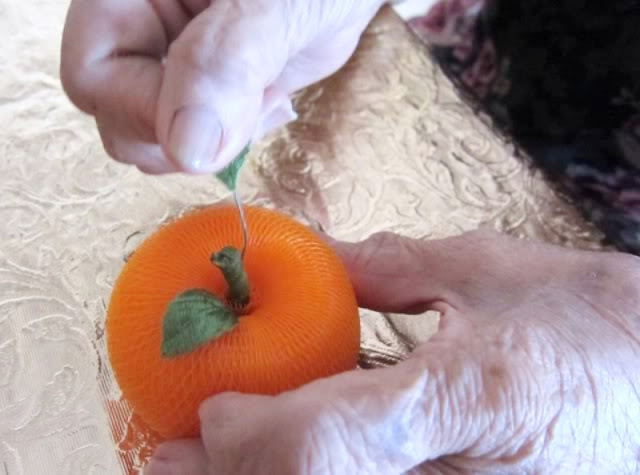 Check out Jewel Bag Made By An 81 Year-old Lady! This gorgeous-looking basket is a Chinese New Year Gift From Student. Here's wishing all a Happy and Prosperous CNY, with love from Singapore! You mother is amazingly talented! These oranges look like you could take a big bite! Shirley, Happy Lunar New Year to you and your mum and all at home. Ann, hahaha! U're too humble. She visits old folks home & makes crafts for them, & sometimes auctions her crafts & donates the money to charity. She's my idol! Happy CNY to u too! Wish you a very Happy Chinese New Year!! Amy, oh yes! They do look real from afar :) Thks & have a great weekend! Aemy, u have a smashing CNY too & collect lots of ang pows. Hahaha! Just realized that all the comments above are from readers starting with 'A'. Maybe it's a good sign! Great work! Your mum really have very dedicated hands. I like all her craft work and must really thanks her for the lovely bangle she make in one of your last giveaway. Lucky me, i'm one of the winner. 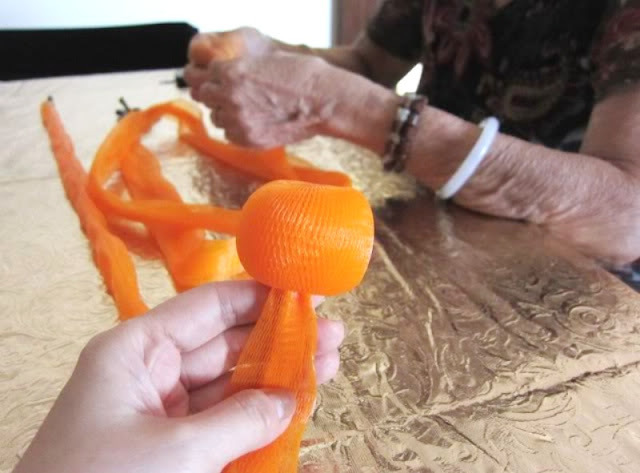 What a great idea to replace real oranges with these DIY one. Great idea! Small Kuching, Happy CNY to u! Your mom's "mandarin oranges" are so pretty! She is very creative. Happy CNY to you and your mum. Can you pester her to teach us her purse and the handmade bangle. We all learn a few life skills around here. May this new year bring with it tons of wealth and help you advance in your degree of black belt in shopping and most importantly good health. creative and brilliant idea. where do you get the orange nets from? Your mother seriously has some skill. These are cute! Ash, sounds like a great idea! In fact, I'd a round of Giveaway previously; beaded bangles made by her. Thks so much for your lovely comment & it's great connecting with u! Missyblurkit, as mentioned in my post, u can get it at any handicraft shops. Glad u like it! especially the Jewel bag...she's a pro! Happy Chinese New Year to you too! Looks like both your mum and you are so creative. 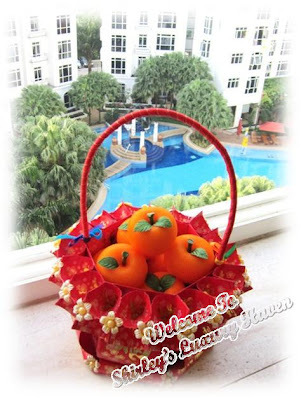 Lovely way of giving oranges and I am sure everyone will simply love it. Btw, thumbs up to your mum to for the wonderful looking bag. 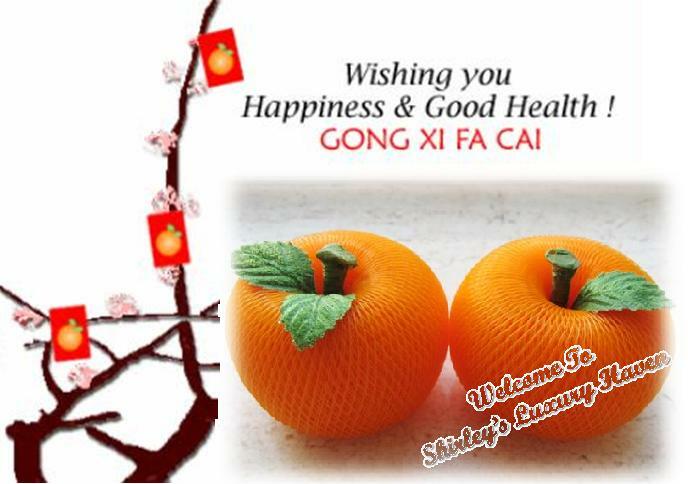 I understand that you will be busy with CNY as I am also the same Shirley. I have my Chinese godfamily, my Chinese in laws and friends to keep my busy too. You have a great and wonderful CNY and also to everyone at home. Nava, have a Happy CNY too! Great idea and environment friendly! Shirley, I admire "crafty" people and their creations! What fun, and so pretty. Thumbs up to your mom, Shirley! She's just so creative! I am truly impressed! Happy Lunar New Year! Your mom is so talented...I can see where you get your creativity form :) These are so pretty and perfect for the new year greetings! Charles, hahaha! It's in the genes. Bessie, thks & Happy CNY to u too! Iriene, thks for visiting & Happy CNY to u too! Kim, welcome to the club! Heehee! Jay, thks & have a wonderful week! Alisha, it's very nice of u to say that! Thks, dear! You have a creative mum! Charmaine, thks dear! Happy CNY! Just drop by and wish you a healthy and happy dragon year ahead. Gong Xi Fa Cai ! O thats such a great idea Shirl! Hi can I check with you where did you buy the cheap fishballs where u bought for 9 for $1? I can't quite find the location because u only mentioned #01-17. do u have the full location? Thanks! Anonymous, the address & map is in the Part I & the link is in the same post. Here it is: Seafood Bargains At Woodlands Terrace. Happy shopping! Hi Shirley, I think your moms' DIY oranges are a great idea, our family received 3 large boxes of mandarin orange this year, I seriously doubt a family of 5 could finish that all before they go bad. We would try to take the to school and office for our friends. 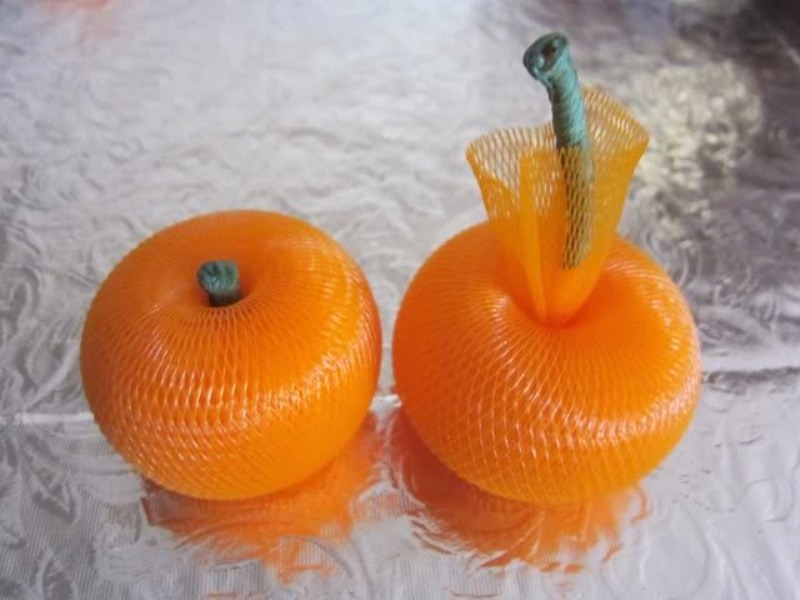 These DIY oranges not only serve as nice decorations, it would save us the need to waste food unnecessarily (while people in Africa are starving) lol. So neatly done.. 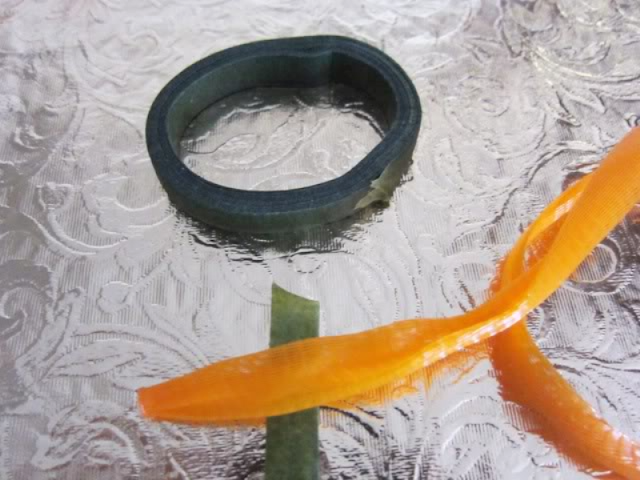 I have tried doing the oranges with the nettings before..but without the green stem and leaves.. sort of not completed.. :) But the jewel bag, that is really something! Reana, guess u'll need to add in those to make it look real. Yap, kudos to my mom! 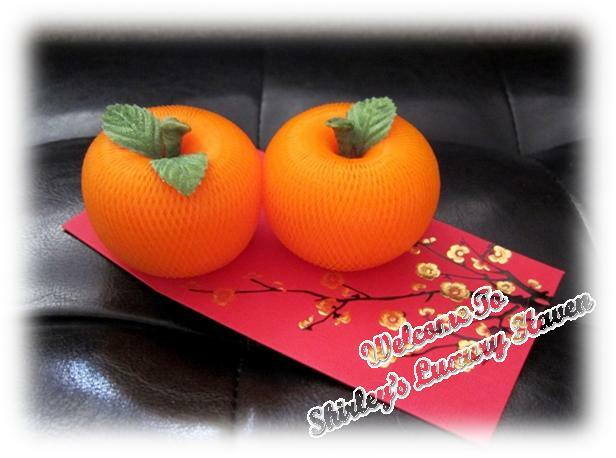 Hi Shirley, I am currently sourcing for supplier to make this DIY mandarin orange and I came across your website. It was really amazing. May I enquire if you would like to make 4000 pieces for my company? Or you have any idea where I could get it? Thank you for your time with much appreciation. 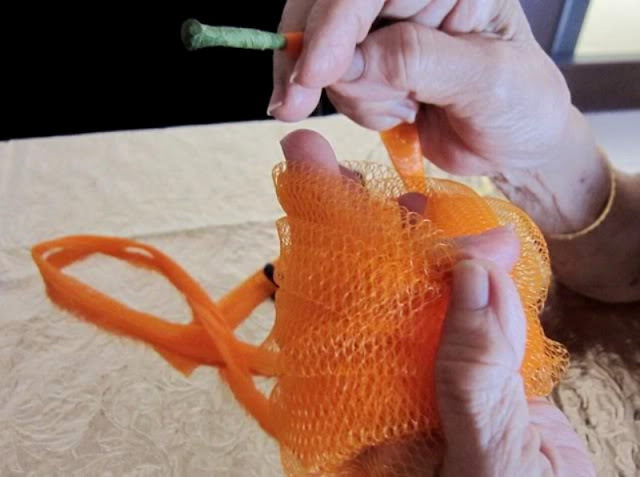 Hi Shirley, I chanced upon this tutorial and could i check where did your mum get the orange nets from? Thanks! 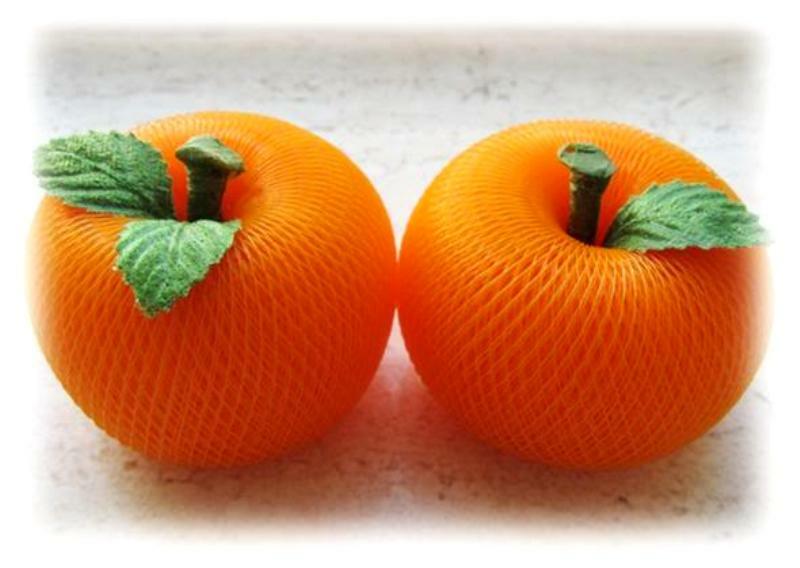 hi May i know where to get the orange net???? Hi, thanks for popping by! As mentioned above among the comments, handicraft shops like in Chinatown will sell the materials. Hope you'll have fun! Pleasure is mine & I hope you'll enjoy the crafts as much!